This simple and yet well-performing accessory will allow you to add video conferencing capabilities to your SpeechWare TableMike. Although designed for the 9-in-1 which has a USB port on the top of the base, it could also be used while plugged into the accessory USB port on a 6-in-1 TableMike. Focus Range: 5cm ~ infinity. Low barrel/pincushion distortion at edges of visual field. Low focus variation at edges of visual field. 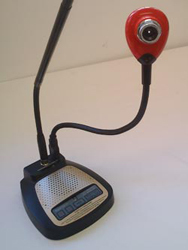 8/7/2014 – Can this webcam be plugged into a USB 2 port on a desktop and work without the speechware mic? Response From Speech Recognition Solutions: Yes, this will work while plugged into the USB 2 port on any device, including your desktop.